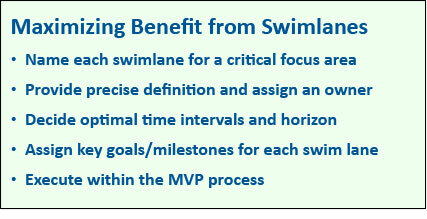 Swimlanes provide a good model for focusing efforts in groups trying to reach the Next Key Stage. In my work with startup ventures, I encourage management teams to develop a list of swimlanes. Each swimlane encapsulates effort for driving to the next stage of product development, branding, digital presence, funding, recruiting talent or increasing revenue. This article is a continuation of my series, “Agile Agile: The Agile adoption of Agile methodologies”. In the series, I am showing how teams can quickly start benefiting from Agile. Transitioning to Agile can be accomplished with minimum disruption and maximum productivity gain. In organizations, Agile methodologies can be used to help product development and can improve to all aspects of growth. This works equally well in venture-backed startups and large companies. My first article focused on easing the transition to Agile by thinking of Agile as a Second Language. Next, I used MVP Spreadsheets to show how companies can leverage existing efforts and move to Agile with minimum disruption. In this article, I use my interpretation of swimlanes to show how companies can extend the benefits of Agile beyond core product development. The benefits of Agile are applicable every aspect of growth. I developed these techniques over the past ten years with clients and as a manager at Cisco, then Intel. They work equally well in startups and innovative teams within large corporations. Team size is flexible. All the management stakeholder teams have been 6 – 12 individuals. Engineering teams have varied from 12 to well over 100 multi-function contributors including engineering, testing, design, scrum masters and product architects. If you are driven to reach the next stage on the path to delivering great products, the swimlanes model is worth considering. In classic process management, a swimlane is a visual element used in process flow diagrams to distinguish business processes. A simple example from Wikipedia shows a flowchart overlaid on a set of columns. The flowchart steps are arranged in columns. The columns are used to associate the steps with processes that contain them or people responsible for delivering them. Imagine a flowchart for developing a feature in which the task flow spans design, engineering, usability, functional testing and performance testing. My interpretation of swimlanes is broader and less restrictive. To me, a swimlane is any critical focus area. Examples include User Experience Design and Digital Presence. Each is paired with required, high priority work and assigned to a specific owner in the organization. I do not use swimlanes to make complex flowcharts. The lanes flow horizontally. Vertical markers indicate calendar dates and sprints boundaries. Imagine you are swimming a 400-meter relay medley. Instead of four round trips, you lay 8 Olympic pools end-to-end. Laps are marked at each eighth of the total distance and associated with elapsed time. More markers are added for each significant stage in the 400-meter swim. When does each swimmer enter and leave the water? When do they start their kick? Each swimmer swims a different stroke, so the total distance is divided into four phases. Lanes for each swimmer have different markers at various points along the length. In a recent engagement, I helped a company seeking Series A investment. While in the Seed stage, the company was entirely focused on proving their inventions, writing good code, deploying to test sites and demonstrating unique value. Typical for Seed stage. Companies need to have a broader set of capabilities and strengths for Series A. Each swimlane has distinct timing, priority and resource requirements. Some swimlanes were already existing and flowing. Among the new swimlanes, some could start immediately, and others deferred for lower priority or resource limitations. We can build a swimlanes spreadsheet from such a list. After information is collected and analyzed, the spreadsheet can flow into the “Agile Agile” methodology and help a company achieve goals with minimum disruption and maximum productivity benefit. 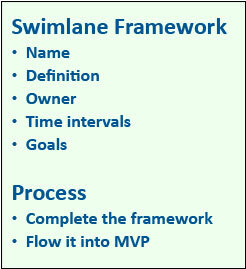 The swimlane framework is a simple set of steps for defining the swimlanes, setting up the goals for each swimlane and flowing into the MVP process. Start with an empty spreadsheet to make a list of all swimlanes. Gather your team around a big screen or a shared screen on Zoom or Google Hangouts. Everyone contributes ideas and one moderator types them into the first column named, “Swimlane Name”. The names will come thick and fast until everyone has their say. The moderator is typing the names. This person should look for similarities, repeated themes and synonymous names. Some ideas are not separate lanes, but just expand the scope of an existing lane. In some groups, the moderator can manage these refinements while the team is naming lanes. If this is challenging, just record all ideas and save the refining for later. Refining, pruning, aggregating are essential. I call this distilling. You will be using these names for a significant time, so it is essential to refine them and nail down the best definition. In the example above, User Experience Design and Front End Technology are closely related but critically different. Also, Customer Acquisition, Customer Provisioning and Customer Support are all similarly named but distinct and separate. Once you have the full bin of ideas, the team can adjourn while one or two moderators finish distilling the list. The result is a set of swimlanes that precisely cover the top focus areas for reaching the Next Key Stage. The moderators should also write one sentence “Definition” for each swimlane in the second spreadsheet column. When the group reconvenes, review the moderator work and tune it to reach consensus. Next, assign an “Owner” for each swimlane. Certain individuals will own more than one swimlane. 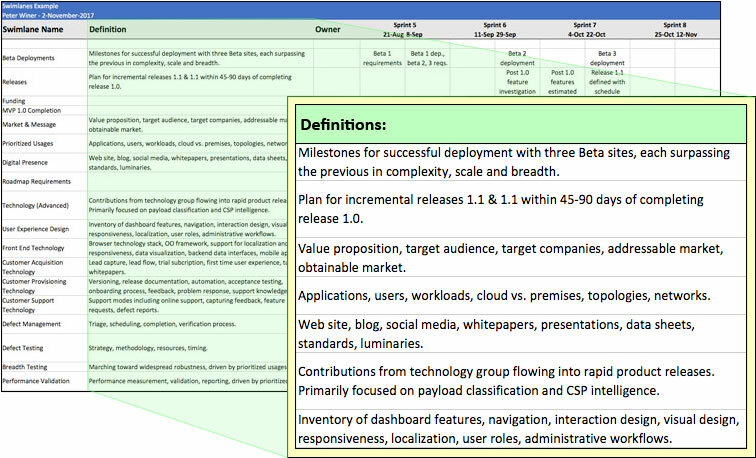 In my example, a single person held Market & Message, Prioritized Usages and Roadmap Requirements. Another individual controlled the three Customer Technologies – Acquisition, Provisioning and Support – plus Digital Presence. Finally, the group should discuss time intervals. 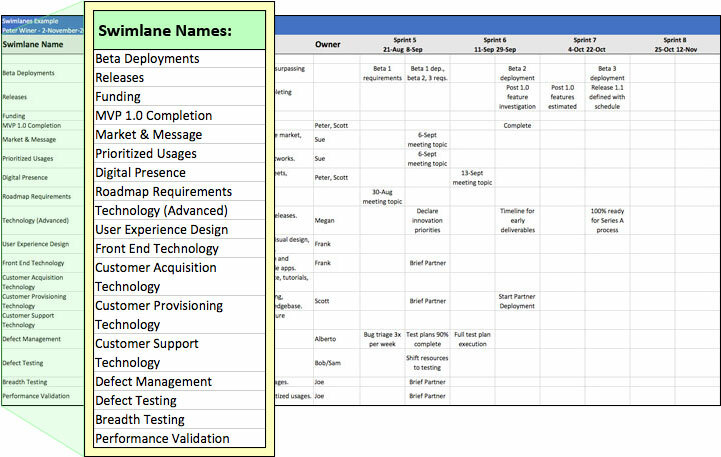 The spreadsheet has three columns so far named, “Swimlane Name”, “Description” and “Owner”. Define the next 10-12 intervals of time. In most cases, one-week intervals work well. Add ten columns named “Week 1” to “Week 10”. If you are already sprinting, you can synchronize the interval columns to sprint boundaries. 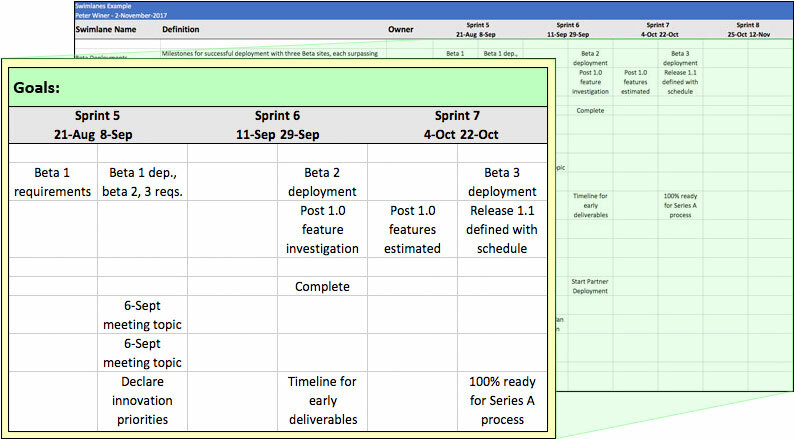 In my example, the team was already executing 3-week sprints, so I assigned two columns for each sprint. Now adjourn. Each swimlane owner should define goals and milestones across the set of intervals. Most swimlanes will have 3 – 4 goals. Owners should create a phrase for each and submit them to the moderator. The moderator will collect and add all swimlane goals to the spreadsheet. The result is a set of horizontal lanes aligned with time-based markers stretching to the 10-week horizon. This is similar to the 400-meter Olympic pool above. The moderator should screen for high-level consistency and feasibility. Are any goals prerequisites for others? Are they in the correct order? Is there too much overlap? Do we have the people and resources drive all swimlanes in parallel? The moderator can resolve some issues independently. Others will require a caucus with one or more owners. Some require the full team. The moderator should work offline to resolve all issues that don’t need the entire team. This should elevate the plan consistency and feasibility. The team reconvenes to ratify the moderator’s work and resolve the full team issues. The team should also take a hard look at the big picture. Can we accomplish everything? Always prioritize limiting the scope and raising quality. Should specific goals be pushed to a later time? Should we defer starting certain swimlanes until a later date? At this point, we have a set of agreed swimlanes with agreed goals and timing. This is a great accomplishment. Now turn the focus to execution. Each goal can be translated into a thing for the MVP Spreadsheet by mapping the columns. Execution can get a little tricky here, and I will cover this in more detail in a future article. The swimlane and MVP spreadsheets are meant to be simple tools for starting to adopt and extend Agile in your organization. At some appropriate time, it makes sense to reduce reliance on spreadsheets and move to more formal tools with a specific Agile purpose. Kanban charts represent swimlanes in most agile tools. The views in Zenkit are an excellent place to start when spreadsheets are no longer sufficient. Once you translate swimlane goals, they can be managed using the MVP process. Reference my MVP spreadsheet article. 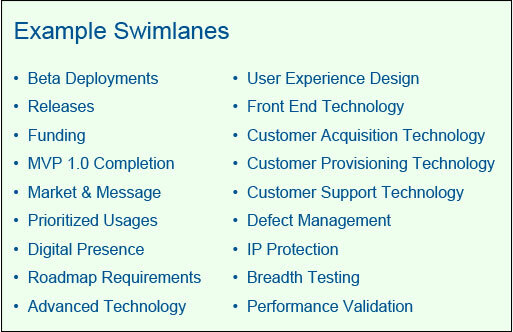 The combination of swimlanes and MVP is very potent, and it exemplifies two critical facets of “Agile Agile”. First, it is possible to adopt Agile with minimum disruption and maximum productivity boost. Second, Agile can extend from product development to managing and improving all aspects of company growth.